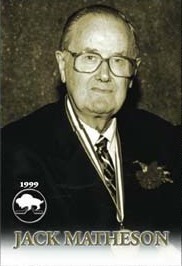 Born in Winnipeg, Matheson began a 35-year newspaper career in 1946 with the Winnipeg Tribune. In 1959 he became the Sports Editor, a position he held until the Trib ceased operations in 1980. "Matty" covered all sports, including hockey, for the Tribune, the Winnipeg Sun and several special interest papers. Jack Matheson also enjoyed a stellar radio broadcasting career with CJOB. The Manitoba Sportswriters and Sportscasters Association presents the Jack Matheson Award annually to students pursuing a career in sports communications. He was also named to the MSSA Media Roll of Honour.